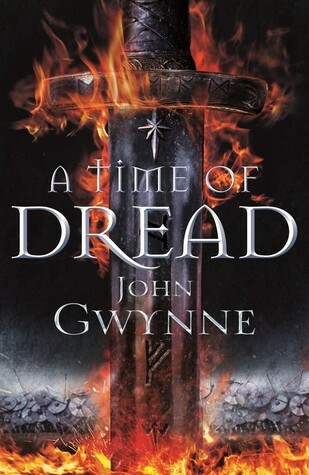 A Time of Dread by John Gwynne. Orbit Books, 2018. Paperback. 480 pages. Before starting my review, I will first confess that I have not read Gwynne's The Faithful and the Fallen series. I have it up at the top of my 'want to read' list (it's a mental list, sure, but's still a list! ), but this is coming out really soon and Orbit sent me a copy, so... I had to read this one! Rest assured, it is not necessary to have read the previous series (Gwynne says this himself), but it would help to provide some backstory. A Time of Dread takes place in the Banished Lands, the same world as his Gwynne's previous series, but it takes place about 130 years after the events of those books. To take a quite from John Gwynne himself answering a question about this book, "just as if you were reading a history book, you could read about the Fall of the Roman Empire without knowing all about Julius Caesar, but if you did, it would make the reading experience a little richer and deeper." And this is why I plan to go back and read the other series, because I have no doubt that it will be brilliant if it has even half the skill and wonder of A Time of Dread. What I loved the most about A Time of Dread was that it felt really unpredictable. I truly could not anticipate many of the events that occurred in this book, and that is starting to become a rare event; it is also a surefire way for me to know that a book or series has great potential and that an author really knows that they are doing. There was something unique about this book that really captured my interest and made me genuinely curious to find out what would happen in this world and with these characters. Along with the unpredictable nature of Gwynne's story, I also found that Gwynne's writing was much simpler than I expected--and I mean that in the most complimentary way possible. Fantasy often has a tendency to become bogged down with extraordinary large amounts of extra information about the world, gods, magic, etc. etc. that, although interesting, can sometimes make things confusing or a bit of a slog to get through. I think Gwynne found a really solid line between having an incredibly rich, intriguing world and having a world that is understandable and also interesting. It felt as if I was given information about the world in simple bits, but at the same time it was still very deep and full of information that made this world incredibly vibrant and satisfying. In fact, it is partly because of how he presented this world and concept that I am so incredibly eager to read his first series that takes place in this same world--I truly want to know more about the Banished Lands and the history of this world. Another area of excellence is with the characters. We follow the perspectives of Drem, Sig, Bleda, and Riv, and each one is fascinating. I won't go into much detail about each one in order to avoid the chance of any possible spoilers, but suffice to say that I found myself enmeshed in each character's life. I particularly liked how much development occurred around each character, including both larger dynamic changes and smaller ones. Some, like Drem, discover large secrets and a new, unexpected purpose to their life; others, like Riv, also unearth shocking secrets, but also learn to focus their minds on the goals that they have been training for all of their lives. All in all, I actually enjoyed each perspective (and as you may or may not know by now, I am not always a huge fan of shifting perspectives), particularly that of Sig's and Drem's. A Time of Dread is also very dark, bloody, and violent--which, I mean, the cover alone really conveys this idea well enough. There is indeed a lingering sense of dread that follows both the characters and the reader as we journey through each page together and uncover the darkness that seems to always be lurking around the corner. One last area I'd like to applaud is Gwynne's depiction of battle and fights--these were bloody brilliant (no pun intended). As I've mentioned in previous reviews, I tend to find myself easily lost in long battle scenes that have an exorbitant amount of action and movement--something about the spatial aspect tends to get messed up in this tangled head of mine. As a result, a lot of battle scenes sort of become blurs and may or may not get the skim treatment when I try to read them... except, fortunately, for Gwynne's. I was able to actually follow these fights. Gwynne describes everything so well and so carefully that I could truly picture what was happening and I found myself actually enjoying the scenes of action, which is really pretty rare for me. Overall, I've given A Time of Dread five stars (surprise, surprise), and I truly can't recommend it enough to any fantasy fan---or anyone simply looking for a good book! This sounds like a pretty amazing read. I like the idea that the writing style is clean and concise and not overloaded with so much extraneous information. That is something that often drives me crazy with fantasy. I have a hard time actually visualizing the world if I'm getting bogged down by the writing.